Texas attorney general takes aim at Best Buy… Hurricane Harvey and the War on Cash… a reader questions The 5’s veracity.. .and more! Another day, another record in the cryptocurrency market. The total market capitalization of global cryptocurrencies stands at $164 billion. When last we took note of the number five days ago, it was $154 billion. 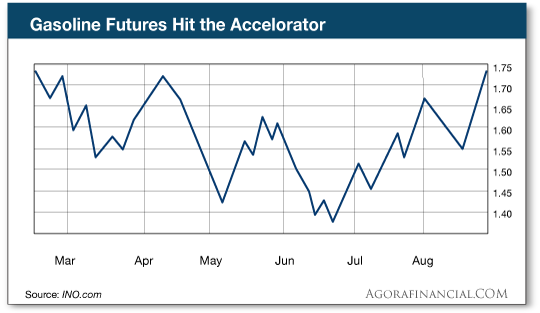 That’s a stunning trajectory — from $18 billion at the start of the year to $100 billion in early June to today’s dizzying heights. The jump this month is even more impressive when you consider bitcoin, the original crypto, has spent the last two weeks going nowhere — oscillating between $4,300 and $4,600. All of which raises a logical question, one which some of our readers have asked. Is crypto in a bubble? 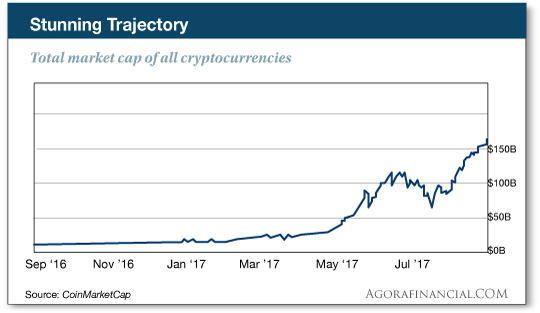 “Yes, cryptocurrencies are in a bubble,” says James Altucher — best-selling author, former hedge fund manager, venture capital maven… and the newest addition to the Agora Financial team. Now, don’t get the wrong idea. We haven’t been leading you down the primrose path with crypto this summer. From the outset we’ve said you have to choose carefully from the 900-plus cryptocurrencies out there. As he well knows. James has had a hand in the crypto market since 2013. He sold his book Choose Yourself in a bitcoin-only store he created a month before it was released on Amazon. He’s had a hand in some ICOs — initial coin offerings — these last 18 months. And he’s made $1.8 million off a single crypto trade. “The evolution of money, and the evolution of every industry, strongly implies that cryptocurrencies, probably in many forms, will be in our future,” James says. “And will dominate the money supply at some point. Before we go further, let’s tackle another question that’s likely on your mind: Don’t we already have a crypto guru at Agora Financial in the person of Lou Basenese? Yes we do. But if crypto is set to “dominate the money supply,” then we’re talking about an asset class so significant that there’s room for more than one expert on the subject in our stable. Indeed, there’s a screaming need for it. After all, we have several editors who recommend stocks… and no one thinks that’s unusual. It’s a big universe of stocks out there — growth, value, large cap, small cap. That’s the way crypto’s moving too. But for all its future potential, crypto is at a sticky moment right now. Everyone has an opinion. And “everyone is convinced they are right,” says James. “That’s a bad sign. I always tell myself I’m the dumbest person in the room. Then I call the smarter people and ask them lots of questions. And then I read everything I can. And in this case, I read the code. James has now distilled this wisdom into a book called Cryptocurrencies 101: How to Make a Fortune From Digital Currencies. Not at all. Crypto is a big and complex subject, hard to get your arms around. But now James has done that work for you. If you’ve hesitated to pull the trigger on crypto, you now have access to the definitive beginner’s guide. The book is available only through us — not Amazon nor anywhere else. Click here and reserve your copy today. To the markets, where gold is holding the line on $1,300 despite some upbeat economic numbers. The Commerce Department delivered its latest guess at second-quarter GDP. At an annualized 3.0%, it’s higher than the first guess, and higher than the “expert consensus” was expecting. Meanwhile the payroll firm ADP is out with its estimate of new private-sector jobs for August, and it too was better than expected. In theory that means the Federal Reserve is more likely to “tighten” monetary policy as 2017 winds down. So traders are using the economic numbers as an excuse to bid up the dollar and sell off gold. Nonetheless, gold is hanging tough at $1,308. The major U.S. stock indexes are all in the green, but not by much. The S&P 500 rests at 2,450. Crude, meanwhile, has sunk to a six-week low at $46.02. That’s despite Hurricane Harvey shutting down one of the most prolific shale-energy deposits in the country, the Eagle Ford. About 15% of U.S. oil production is out of commission, and might not come back online for weeks. But as we mentioned on Monday, about 15% of U.S. refinery capacity is also out of commission. Add it up and it’s a peculiar situation with falling oil prices even amid rising gasoline prices. “As oil refineries went offline ahead of the storm, there was less demand for oil inputs,” explains our income specialist Zach Scheidt. That said, the impact on the refiners hasn’t been uniform… and Zach says that’s serving up an interesting opportunity. “Under this scenario,” says Zach, “refineries are now able to sell their refined gasoline at a much wider profit margin. And many of these refineries also have the option of locking in higher profit margins by setting up long-term hedges at today’s prices. Aw, c’mon, Best Buy. Why the apology? 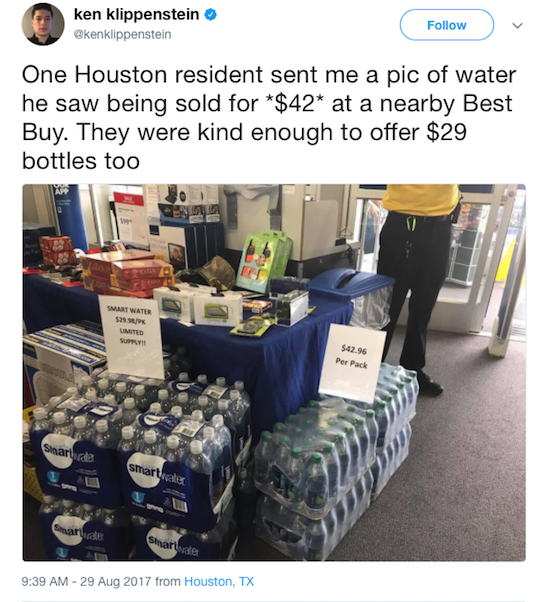 In any event, Best Buy has been shamed into calling the incident a “big mistake.” The chain doesn’t usually sell water by the case, it explained, and workers priced the cases at the single-bottle rate. “If you still think the war on cash has not been won by cash, please explain the truckloads of cash needed in Houston,” a reader writes. The reader points us to a CNBC story citing former Dallas Fed chief Richard Fisher: “Fisher explained that banks will send their armored vehicles to the Fed — either bringing currency back or taking currency out — and then circulate it through the system.” It turns out Houston is home to the biggest vault in the Federal Reserve’s nationwide complex. Says the reader: “The cashless system that you guys say is here (it is not, and will not be in my lifetime) isn’t working so well. They need food, water and cash! “If the $100 bill were not in circulation the Feds would need five times as many armored cars to haul the same amount of cash — not happening. WTSHTF we find out in a hurry what ‘real’ money is. The 5: Uh… marijuana is an all-cash business specifically because it remains illegal under federal law and as such the banks want nothing to do with it. More to the point, the Federal Reserve’s own figures show that the dollar value of noncash payments grew 17% from 2012–15… while the dollar value of checks written is down slightly and ATM withdrawals held steady. Gallup polling says in 2011, 36% of Americans reported making all or most of their purchases with cash; by last year it was down to 24%. No, we’re not Sweden yet — where at more than half the banks, you can’t deposit or withdraw cash — but that’s the direction things appear to be moving. “… your credibility took a hit at 0:40 yesterday when you claimed a 100% gain for Alan’s Knuckman’s recommendations and then quoted a couple of ‘readers’ that, even though his recommendation to sell could not be filled, they supposedly scored big gains. Even Alan admitted that his recommendations could not get filled. “Come on, guys, keep it factual. P.S. We neglected yesterday to include the link inviting readers to subscribe to Alan Knuckman’s Weekly Wealth Alert. In case we whetted your appetite about that 63% gain in 84 minutes and your desire went unmet… here’s where to go.